PrimeStyle.com is your direct jewelry manufacturer. Located in New York City’s famous Diamond District, Prime Style provides you with high quality jewelry and diamonds at low factory prices. Prime Style is exclusively online, and not a retail store, which is why the prices are so low. 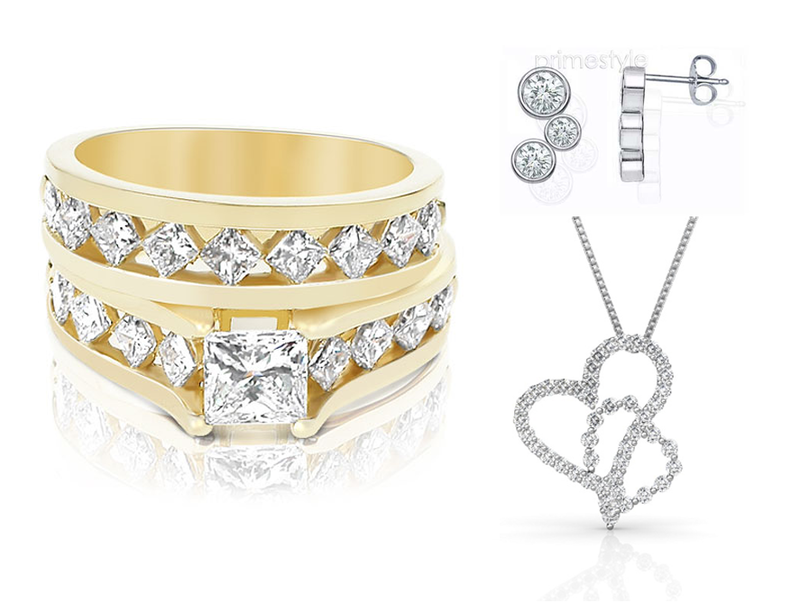 At Prime Style you will find a wide selection of beautifully designed fine jewelry for any occasion. Prime Style manufactures all types of jewelry – from classic diamond studs, to superbly designed rings and custom-made items per your request. Prime Style has an extensive selection of rings for any occasion. In addition to the large selection of engagement and wedding rings – you will find men‘s rings, wedding sets for the bride and groom, and a lovely collection of anniversary rings. 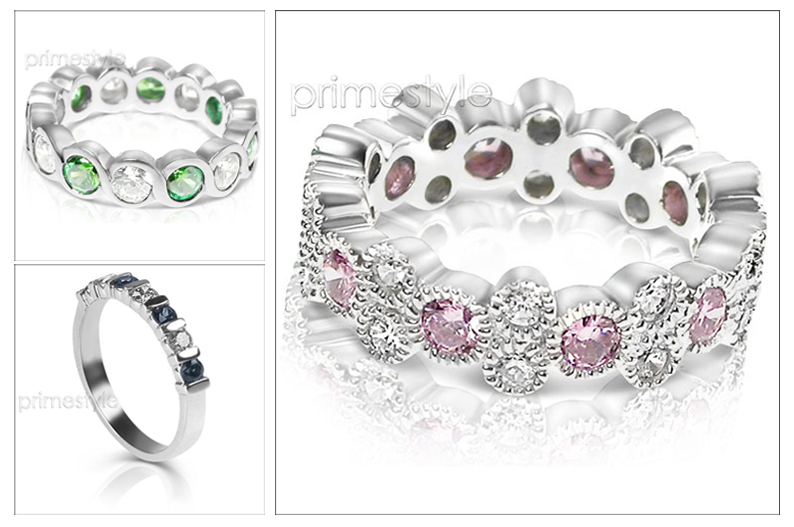 Rings from PrimeStyle.com are unequaled in quality and style. 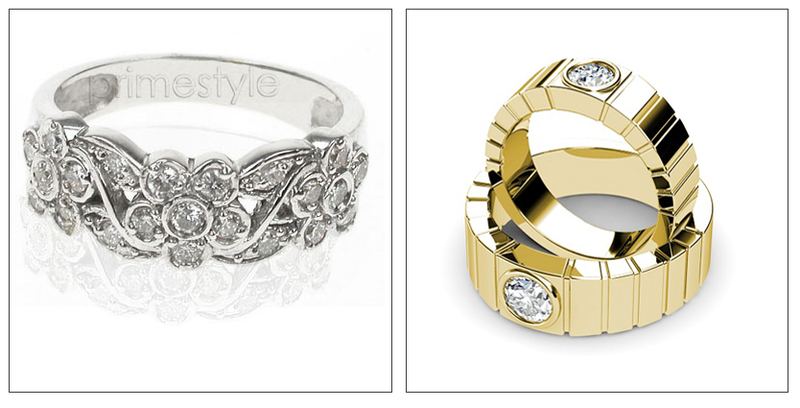 Browse through classic, elegant and high fashion rings to suite any occasion. Find the perfect wedding ring for an everlasting reminder of your special day, or a solitaire ring to celebrate your joyous anniversary. Find the highest quality rings at a price that fits your budget. Prime style offers the option to design and order your own unique items by filling out this form with Customer Service. If you’re interested in a customized ring, the other option is to simply select an existing ring setting, and modify it to your personal taste. On the site you will find the Custom-Ring link to begin personalizing your ring. You first choose the mounting (the ring style) — the setting style, shape of diamond, type of metal, and a price range. 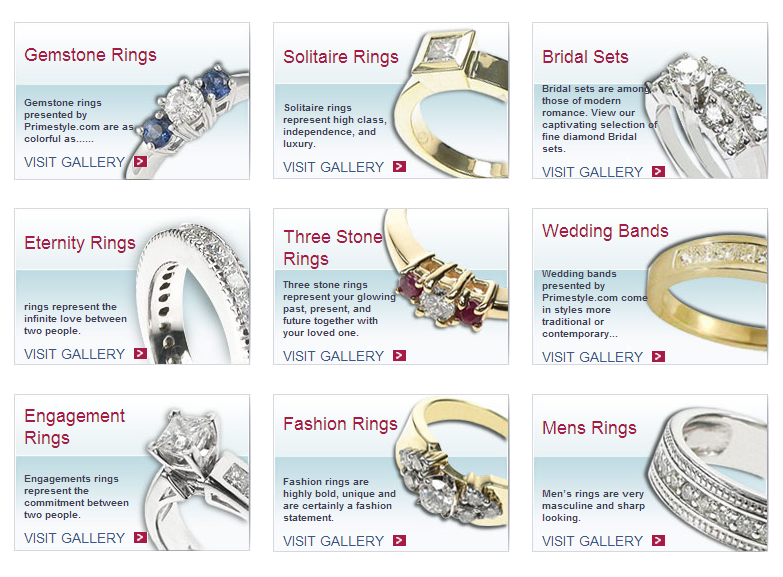 The site will automatically present a narrowed-down gallery of rings that meet your requirements. Once you choose the ring you like, you will be able to customize all the elements for making your perfect ring. All Prime Style diamonds are 100% real and were naturally mined. None of the diamonds are treated or enhanced in any way. All Prime Style diamonds are conflict free. Prime Style is a registered member with “StopBloodDiamonds.org”. Click here to view the official certificate. 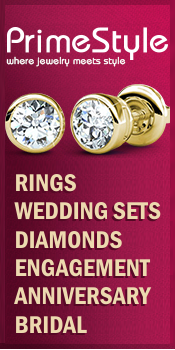 All items come with a diamond guarantee and appraisal certificate. Prime Style also provides a price guarantee – to be of a significantly lower price than retail. When you purchase a Prime Style piece of jewelry you get to choose the actual size, shape and quality level of diamonds, to meet your individual style and price requirements. Although you are shopping online, Prime Style provides full and personal customer assistance from a Prime Style representative, while choosing and placing your order. This way you are sure to make the best selection for your needs and ensure your satisfaction from your jewelry. 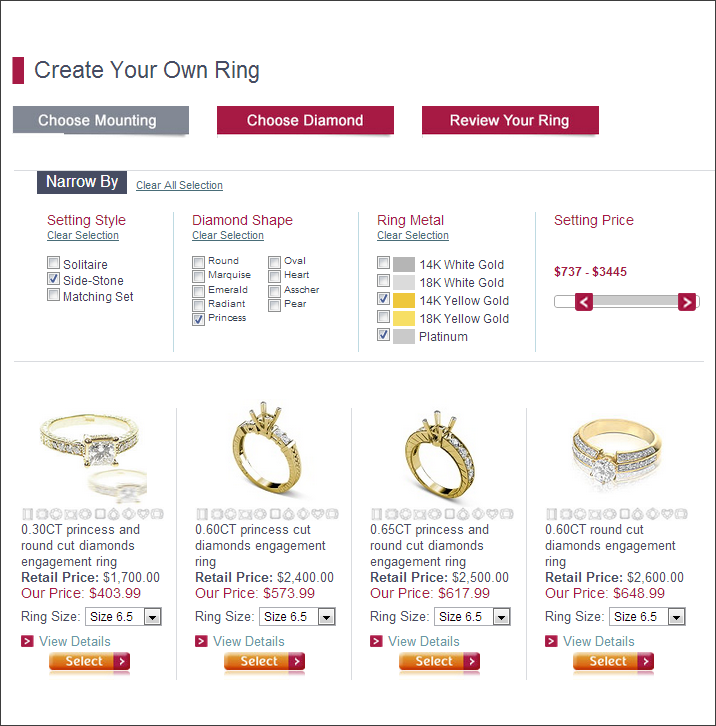 Even if you are less than a Diamond “Connoisseur”, Prime Style’s website provides you with all the basic information you need about diamonds and jewelry settings, in a clear and user-friendly way. When making such an important purchase, you want to know you are getting the precise design you wanted, and the best value for your buck. 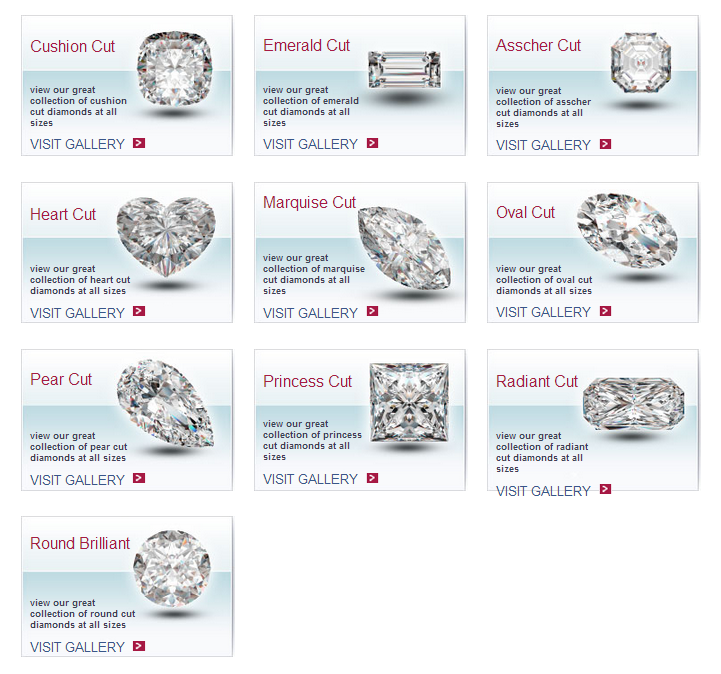 Prime Style’s Learning Center helps you by providing great information about diamond shapes and color, types of settings, the types of metals you can choose from, and of course finding your proper ring size. Prime Style accepts all major credit cards, PayPal, personal checks, money order, and bank wire transfer. Prime Style offers free shipping within the US and internationally (only customs and duties fees for intl. shipments are to be paid by the customer). Prime Style is your Direct Factory, Jewelry Manufacturer and makes each item as it is ordered. Orders take 3 business days to process and 1 business day for shipping within the US, or 1-3 business days for international orders. You will receive an email notification as soon as the item is shipped out, together with the tracking number. All Orders are packaged in a beautiful jewelry box. Prime Style offers a 30 day return policy with no restocking fee: “100% SATISFACTION GUARANTEED!!! We are so confident in the quality and value of our merchandise that we see no reason to charge our customers a return fee. Your satisfaction is important to us and if you are dissatisfied for any reason, you may return the item for an exchange or a full refund.” Click here for complete return policy details. Check out what I have to say about Prime Style!